When I was a little girl, my favorite gifts from my parents were always new sketchbooks. I could spend hours alone in my room, drawing and doodling, filling up sketchbook after sketchbook with pictures, ideas, and (let's face it) a healthy dose of nonsensical ramblings! My parents were both artists (one by trade, the other by hobby), so they knew first-hand the importance of starting with a blank canvas. Just recently, I had one of those Oprah "Aha!" moments: I realized that even after all of these years, I still can really benefit from a blank canvas. Starting off the day with an open sketchbook gives me the focus and direction I need. I came to this realization while I was eating my breakfast last week, with a view to the woods, re-reading (and heavily underlining) Walden and feeling a sort of corny kinship across the ages with Thoreau. (I totally "get" his desire to live in the woods and work undisturbed!) I had a sketchbook near me on the table, a pencil ready. From time to time, a thought would flutter by and I'd scribble it down, then go back to my reading. After breakfast, I moved to the couch with my sketchbook. I had a different view of the woods, still tranquil. My velvety-eared dog, Delilah, curled up next to me on the couch for a good dog-nap (snoring included), and I let my hand just wander across the pages with a pencil, making random designs and notes, catching little wisps of thoughts. Almost an hour went by, and then the phone rang. The ringing jarred me out of intense concentration. I realized that I'd been totally "in the moment" with my own thoughts, completely unplugged from the outside world. I felt creatively rejuvenated. My mother used to say, when she was frustrated with her painting, "I can't hear myself think!" It puzzled me when I was a little kid, but now I know exactly what she meant. If you can't hear yourself think, you tend to move through the day on auto-pilot, without any clear focus or direction. You have to have the time, the space, and the silence to tune into your own frequency. Pick a "sacred time." For me, mornings are sacred, which means that I don't schedule any appointments or meetings before 11:00 a.m., if I can help it. I don't make any phonecalls, and I limit any internet time. Block out a time on your daily calendar when you're going to focus your attention fully on your creative work. Mondays and Tuesdays are my biggest creative workdays, so I try not to commit to anything else on either day. Choose a room with a view, but not one where you're watching a whole circus pass by. If you don't have a calming view, find some tranquil pictures for your office or work space. Use the power of silence or chimes. I know it sounds terribly "New-Age-y", but wind chimes soothe me. My good friend Alex sent me wind chimes as a housewarming gift many years back, and it's still one of my favorite gifts. It's so calming and meditative to hear the wind playing its own little tune outdoors, and its rambling "melody" is perfect for random idea-generating. Don't get overwhelmed with trying to think up "The Big Idea." Just doodle. Free-associate. This is called "Mind Mapping" in the corporate world; for creative types, it's called art journaling. Aim for at least 15 minutes of uninterrupted, super-focused time every day. If you have a full schedule, don't stress yourself out with trying to set aside an hour or two. If the only time you're not going to be interrupted is when everyone else in the house is asleep, then use that as your "sacred time." Or set your alarm a little earlier in the morning. Just carve out some dedicated time and make it a priority. Most of all, just relax and repeat these steps on a regular basis. Listening to yourself think--to your impressions, to your ideas, to your instincts--is one of the most important things you can do for yourself. My parents were really on to something! P.S. If you liked this post, try 12 Ways to Pull Yourself Out of a Creative Rut. 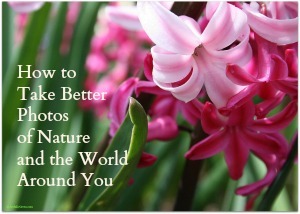 Like the photographs on this blog? Join me and learn how to take pretty pictures of your own, even if you have a full-time job and a camera that's not fancy-shmancy! Just a few spots left for my online photography course starting on November 3: "The Art of Photography: How to Take Your Pictures to the Next Level." Click here for details.